I’ve said many times in the past that OpenStack is “Cloud for the Rest of the World”, in that it has tremendous potential to deliver cloud solutions where technology, regulatory and other constraints might inhibit innovation. These aspects in particular makes it the ideal building block base for Government innovation. OpenStack provides a “glue like” function that provides a flexible framework for a vast and diverse array of new cloud native and old traditional IT technologies to work together. With increasing demand in the Government sector for speedy delivery, opening up data to innovative hacking and of course increased protection from security threats, OpenStack and the open source projects throughout its vast eco-system tick all the boxes addressing those issues. OpenStack also supports and encourages an operational and cultural human revolution that advances efficiencies, which in these days of constrained budgets and resources is highly attractive. 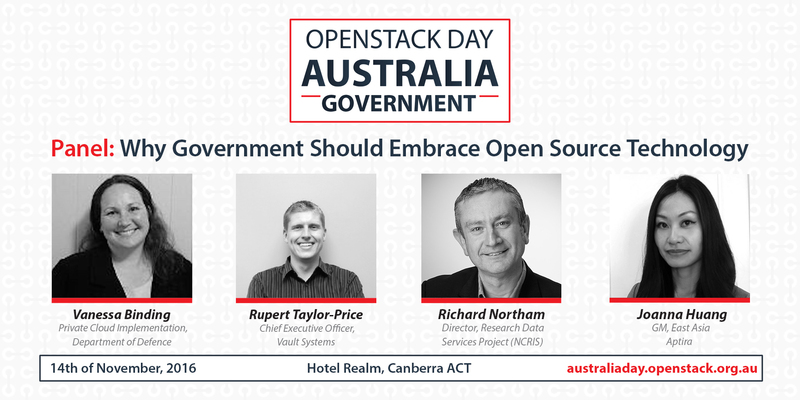 At OpenStack Australia Day: Government next week, we will hear from several industry leading figures. Vanessa Binding from the Department of Defence, Rupert Taylor-Price from Vault Systems, Richard Northam from NeCTAR and Aptira’s GM of East Asia Joanna Huang will discuss why Government should embrace open source technology during an afternoon panel session. Tickets can be purchased at australiaday.openstack.org.au. Discount codes are available for students and eligible attendees. Please contact us for more information. Your ticket includes access to all sessions, great food, networking drinks, swag and prizes. Next PostOpenStack Australia Day Government. 1 week to go!